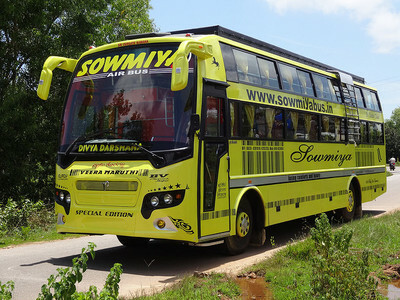 Experience bus travel like never before with Sowmiya Tourist! Our sincerely thanks to all our agents, customers & workers. I was travelling with my college friends from Mangalore. It was our dream trip and we wanted everything to be perfect. We booked tickets with Sowmiya Tourist as suggested by our seniors. Their review was true as we had a smooth trip at a very reasonable price. We still have the memories fresh in our mind, how we enjoyed the whole trip. I travelled with Sowmiya Tourist a couple of days back. I was in a rush as my dad was feeling unwell and had to reach the hospital which was 6 hours away as soon as I could. 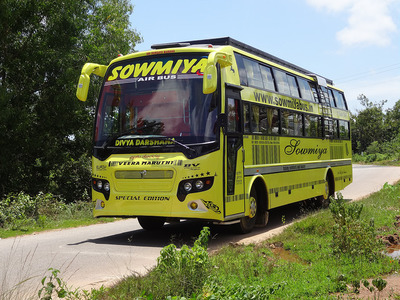 I booked a seat with Sowmiya Tourist and to my surprise they helped me reach before the time of arrival. I was travelling with a huge gang of friends from Udupi with Sowmiya Tourist. We were really skeptic about the comfort of the bus. To our surprise the journey turned out to be very comfortable and we also enjoyed a lot. The staff on the bus was quite amiable and they came up with great suggestions for our trip. 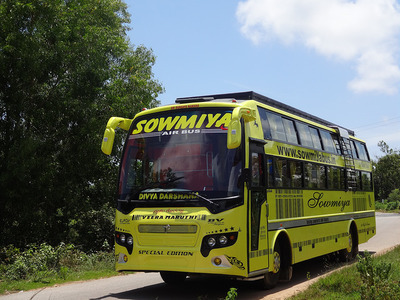 I recently travelled from Bangalore with Sowmiya Tourist. It was a sleeper bus and I felt the bus was very comfortable and the staff was very friendly and co-operative. Great going Sowmiya Tourist keep it up. Book 1 seat and get '10%' discount per seat.